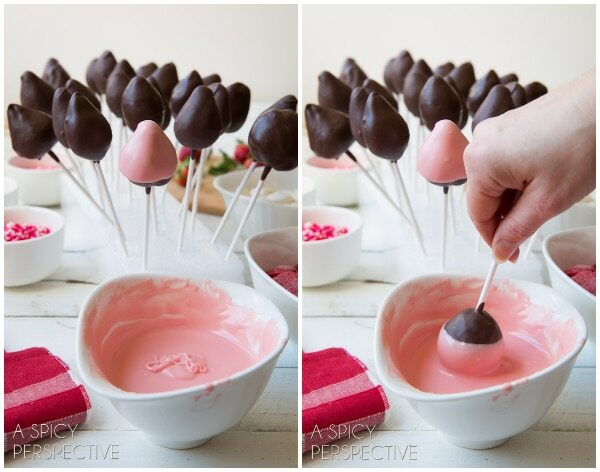 Chocolate Dipped Strawberry Pops – Fresh juicy strawberries dipped in not one, not two, not even three, but FOUR layers of chocolate and sitting pretty on a stick! With all the pink and red cupcake liners, sprinkles, and glittery cards in the stores right now, you should be amazed I was able to wait this long. Two points for will power. The kids always look forward to taking homemade Valentine treats to their friends and teachers. Each year we try to come up with something creative and tasty (but not too complicated) that we can make fresh the night before Valentine’s Day. Chocolate covered strawberries are the quintessential Valentine treat, so this year I thought we’d put our own spin on this classic. Like Chocolate Dipped Strawberry Pops! We placed each strawberry on a long paper lollipop stick and prepared a drying rack out of a piece of styrofoam. I even left the plastic wrapping on the styrofoam, in case we were especially messy. Then we melted chocolate and dipped each strawberry into the chocolate, making sure they were thoroughly coated. After they dried a bit, which only takes a few minutes, we melted colored Candy Melts and took turns dipping the pops in red, pink and white candy coating, to create colorful layers. On the last layer, we sprinkled the tops with Valentine candy sprinkles! Viola! 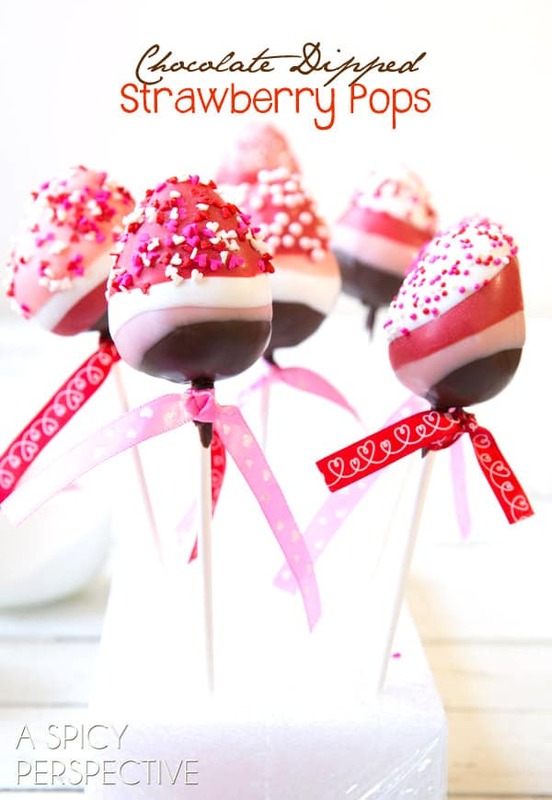 Chocolate Dipped Strawberry Pops are a decadent treat the kids can make almost completely on their own. Their faces were priceless as they bit into these Chocolate Dipped Strawberry Pops. With mouths full of chocolate and strawberry juice dripping down their chins, they agreed this was the treat to wow their friends, letting them know just how much we love them. 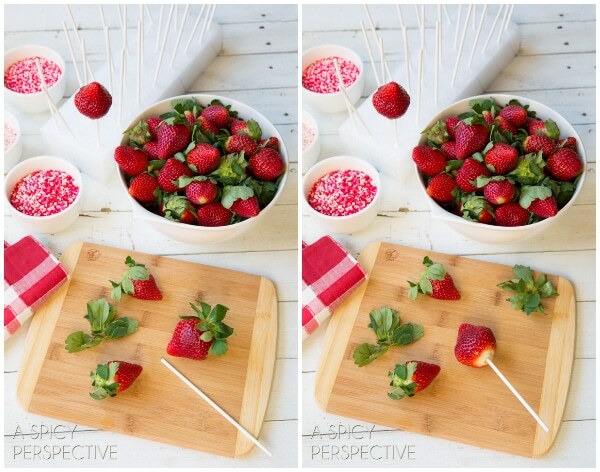 Pinch the stem and leaves off the top of each strawberry and gently insert a lollipop stick in the center. Prepare a piece of styrofoam to hold the pops, by punching 24 holes in it with one of the sticks. 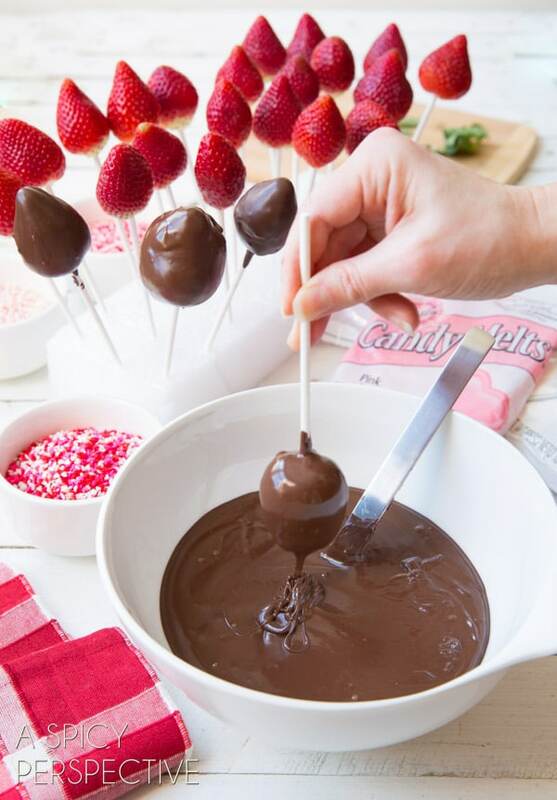 Dip the strawberries in the chocolate, coating down to the stick. Make sure there are no gaps/bubbles anywhere or the strawberry juices will seep out. Gently shake off the excess and place in the Styrofoam holder to dry. After the final dip on each pop, quickly sprinkle the top with Valentine colored sprinkles and place back in the holder to dry. Wrap and distribute immediately. 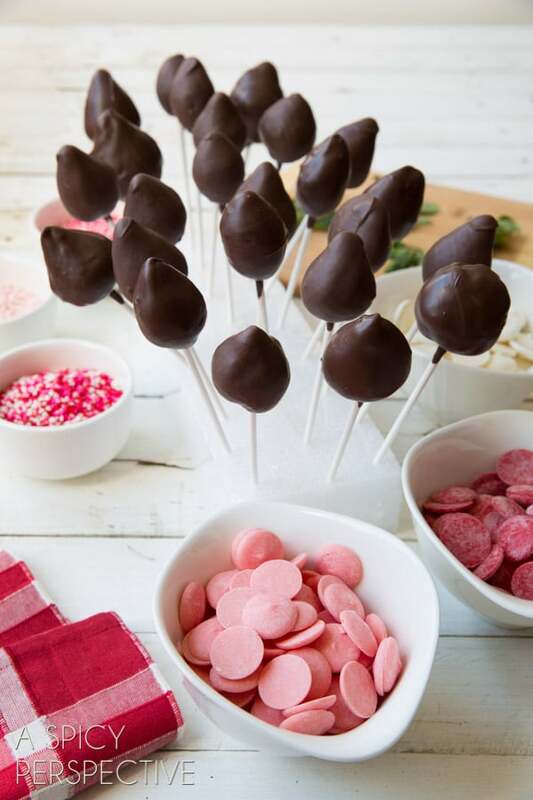 Pingback: 16 Valentine's Day Desserts to Wow Your Sweetheart! Hi, how did you get the pops to stay on the stick while dipping? Mine kept comming off into the chocolate! Uh-oh! Hmmm… Were your strawberries very soft and ripe? It sounds like they might have been a little too ripe. Can you make these a day ahead and store in the refrigerator? How would you wrap them? Making these with my girls as soon as possible!! I’m so sad cause they were just the most cutest thing. I washed off my strawberry sand will try again tomorrow. I really need these pops! Yes, the strawberries need to be very dry or the chocolate won’t stick. Hope your next round are successful! 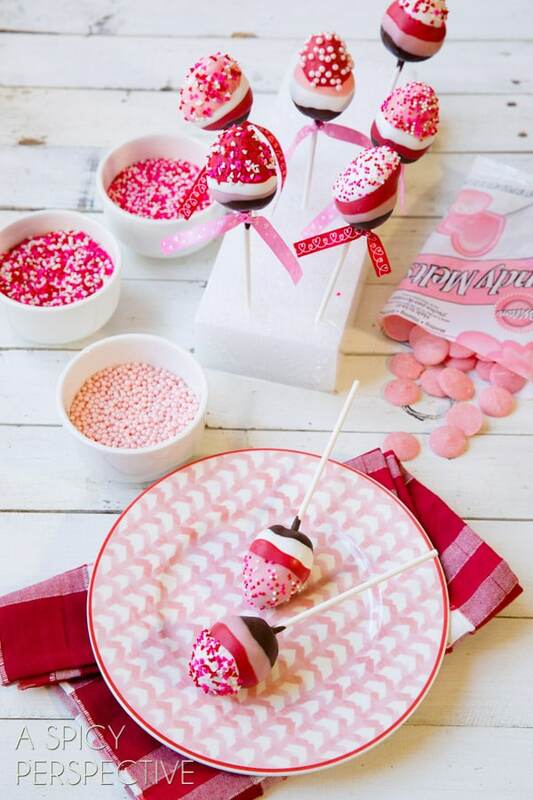 Hi, I want to make these for a Valentines Day theme baby shower but, i was wondering if i could skip the first layer and start with white melting candy. Will it still work? Thank You! Sommer, these are just so pretty! Hi! These are so gorgeous and yummy looking! Would it be okay to use the first pic for my Sunday Funday feature? I’ll clearly attribute it to you and ask that it be pinned from your site. Those look great and easy to make too! I am going to try this. I picked up a 4 pint container of strawberries at Sam’s this morning but I am going to use them to make a strawberry pie! 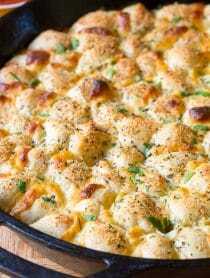 :-) Love your site, good recipes and pictures too! What a cute idea for Valentine’s day!! Too cute, and perfect for Valentine’s! My kids would go nuts for these. They’re so cute! These are just the cutest, Sommer! I can almost taste them! Sommer, these are absolutely gorgeous. My coworker is sitting here drooling and commenting on how beautiful they look. These are perfect for Valentine’s Day. These are so cute love the pink sprinkles! These are so darn cute! Strawberries are my favorite and I love this fun treat! These are so clever! Perfect treat for Valentine’s Day! Hi there, I wonder if your strawberries were wet from washing. That might have caused the chocolate to slide off. Ultimate decadence! Perfect for Valentine’s Day! truth – my level of impatience is so high there’s no way I’d last four round of dipping before digging in. but alas, if you have willpower they do looks pretty amazing! These are GORGEOUS! All you needed to say was four layers of chocolate, and I was in! 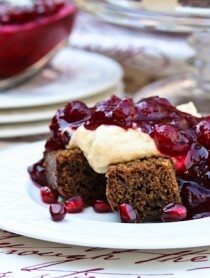 I just shared this wonderful recipe with my readers. Can’t wait to try this one!! I can’t even handle the cuteness of these Sommer!! Absolutely adorbs! These may be the prettiest chocolate covered strawberries I’ve ever seen! I wonder if it would also work to use some gel-based food coloring in melted white chocolate for the pink layers… because I have lots of pink coloring + white chocolate, but no candy melts. Might have to experiment over here! OMG! 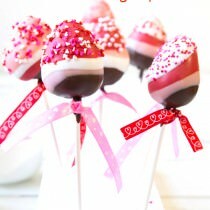 These are flipping adorable and so perfect for Valentines Day! So cute! I love how you took a very simple treat and made it totally new! These are soooo pretty! And way less expensive than purchased ones! Ok, these are seriously adorable!!! Oh my gosh, these are so cute!! What a fun treat for Valentines day! The four colors are so pretty! I might not be fan of pink but I sure could sure use a batch of these to decorate my kitchen with. These strawberry pops look amazing! So fun! These are more than adorable! I am certain that my daughter will be thrilled when she sees this — especially since your daughter is in her class! Love these! Almost too pretty to eat. Almost! These are so pretty! I’m sure the kids had a blast dipping these. I will most likely use your version for a valentine’s dinner I’m attending. You had me at 4 layers of chocolate! These are seriously the cutest things I have seen in awhile! 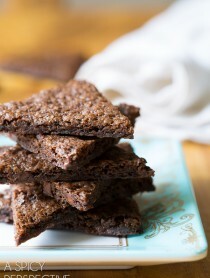 And, they are so easy and much healthier than some of the other Vday treats. So fun Sommer! Such a pretty treat for Valentine’s Day!